Marble composite tilehas the advantages of natural stone performance characteristics, but also practical performance advantages, which also determines the future of its sustainable development trend. The international market, more and more countries and regions widely used, but also verify the marble composite board market trends. ①marble composite tile torque is 258N / cm, 3 times more than the original board. 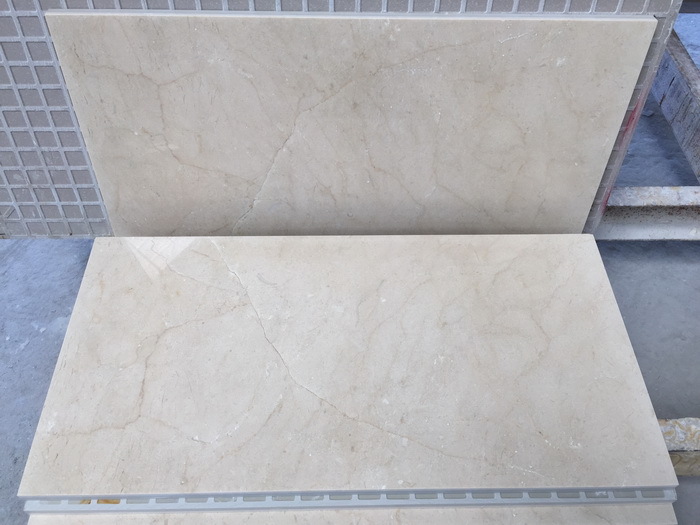 ② no pan-yellowing yellow: As the marble composite panel floor tiles and resin layer blocking the water and corrosive substances, eliminating the marble and cement wet paste after the pan-yellow yellow common problem, the wall stone can be directly wet paste, thus Saving the cost of dry hanging, and reduce the dry hanging angle and pendant occupied space, increased use of the area. ③light weight: marble composite tile than the original weight of light more than 2 times. ④easy construction: Marble composite panels can be used tile construction methods, rather than marble construction methods, so easy to construction, saving construction costs. ⑤bond strength ideal: test shows that the adhesion: 91 N / cm ², specifications for the 600 * 600mm marble composite plate in the 33 tons of gravity under the action will not be stripping. ⑥heat resistance: marble composite panels are hot, long time (120 hours) in the 100 ℃environment without peeling, discoloration and other abnormal reflection. ⑦low water absorption: the marble composite tile on the back of the full adhesion of porcelain tile, so the water absorption (0.13%) is very low, within 0.2%, will not be frozen. ⑧ smooth surface: Marble composite board than the original surface smoothness is very good. ⑨low prices: the use of thin marble tile stick to the thick tiles, so the marble composite board than the original price of about 30% lower. ⑩specifications and diverse: specifications for the 600x600mm and above a variety of specifications Marble composite tile or other specifications of the product, according to customer requirements of production.